Perhaps some of you were expecting some discussion of the whole Don Farrell debacle, but I have nothing new to add except to restate the publicly available facts. This far out from the elections it is too difficult to know the magnitude of the impact on the vote, and even harder to calculate in a way that so much as resembles to pass for political science around here. With Mr Rudd retiring, a variable seat history and a predominantly Liberal state-seat composition (although this is a largely exaggerated indication of Liberal support resulting from a landslide state election two years ago) this seat is obtainable with difficulty for the Coalition. Factor in the muscle that can be gained from being the dominant federal party, united Liberal and National support under the LNQ banner and the prestige of scalping the seat of a former Labor PM, we can expect the Coalition to pull our all the plugs to try and take this one. The loss of any advantage of incumbency will be unfortunate for Labor, and LNQ candidate Bill Glasson out polled Rudd on first preferences last year anyhow. However, I also expect a lot of historically Labor supporters who could not bring themselves to vote ALP last year might return to the fold, and that the 3,000 odd PUP votes are likely to be part of this. My personal feeling is that PUP did well last year due to a combination of protest votes and people thinking it would be humorous to vote for now MP Clive Palmer rather than actual support of PUP policies, and I suspect that normally ALP voters were a far larger proportion of the protest vote than Coalition supporters. If I am right, the PUP will be a one hit wonder that will collapse next election, especially now that Palmer is actually in parliament and is therefore an apparently viable candidate. Griffith will be an interesting test case to see if PUP support has fallen in the last 4 months. TPP the ALP won Griffith with 53% of the vote. This is vulnerable, but it is important to realise that the Coalition has only won this seat once since 1977. I would argue that, although a LNQ victory is far from impossible, this seat is most likely to stay with the ALP, possibly increasing the margin. The seat run-downs were very subjective, largely because this was the summary I used to factor in all of the subjective or non-quantitative information that might play a role in the result. For example, there is no easy way to factor incumbency into a prediction mathematically, so this was dealt with in the run-downs. The run-downs offered two results, a measure of safety and a measure of volatility. These measures roughly equate to an estimate of how likely a seat is to go to one party or another, and a rough margin of error on that estimate or value of certainty. 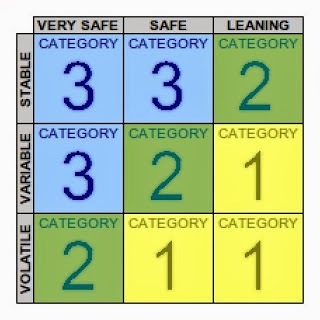 Two seats might be rated "safe", for example, but this is far more solid in a stable seat than a volatile one. Because these measures were based on my personal interpretation of the facts as well my choice of which facts to include, this should be a very poor predictive tool in terms of determining how marginal seats will fall. It is, however, potentially useful in identifying which seats are marginal in a more complete way than looking at margins on the pendulum. Of the 149 seats listed here (I apparently forgot Eden Monaro), 16 were listed as tossups and 32 as critical. 18 more were considered standard or normal, with 83 bastions or very-safe seats. The AEC lists the 22 seats that changed hands as: Banks, Barton, Bass, Braddon, Capricornia, Corangamite, Deakin, Dobell, Eden-Monaro, Fairfax, Hindmarsh, Indi, La Trobe, Lindsay, Lyne, Lyons, New England, O'Connor, Page, Petrie, Reid and Robertson. I will ignore Eden Monaro, whose prediction was accidentally excluded from the run-down summary (and being a NSW seat is not recorded in the raw data), even though I suspect it's history as a bell-whether seat might have placed it as a tossup. I will accept Indi (won by and Independent) and Fairfax (won by Clive Palmer for the PUP) as unavoidable scrapes and bumps suffered in the treck through the political quagmire. Because it is not possible to study every candidate in every seat, minor parties and independents can rarely be factored into nation-wide analysis. Both of these seats were considered to be Bastions because it was inconceivable that Labor could take them; I feel that this assessment is still valid. Despite Lyne and New England changing hands, these were correctly labelled as Bastions for the Nationals because they changed hands to National candidates. In other words, they were considered safe for the Nationals even when the Nationals did not currently hold the seats. This seems like a ballsy call to make, except both were held by retiring Independents and thus had to change hands. Both were no brainers. Thus, just as Indi and Fairfax cannot fairly be considered points against my methodology, Lyne and New England cannot be considered points in my favour. These are just non TPP figures confusing a TPP model. This leaves us with 17 seats changing hands. 4 were Tossups (Bass, Dobell, La Trobe and Robertson), 6 were Critical (Braddon, Capricornia, Lindsay, O'Connor, Page and Petrie), 2 were Standard seats (Coorangamite and Hindmarsh) and 5 were considered Bastions (Banks, Barton, Deakin, Lyons and Reid). This is still a lot of supposed Bastions changing sides. Roughly 30% of seats changing hands were Bastions; this is, however, looking at the results backwards. The question is not what proportion of seats that changed hands were in each category, but what proportion of seats in each category changed hands. 4 of the 16 Tossups (25%) changed hands, as did 6 of the 32 Criticals (19%). Only 2 of the 18 Standards (11%) changed hands, while the 5 Bastions that flipped were a tiny proportion (6%) of the total 83. In these values we can see the increasing resistance to changing hands. As I noted here before the election: "I would not be surprised if this was close run between the Coalition parties in this election, but a Coalition victory is pretty well assured. Whether or not this is worth watching depends, I guess, on your interest in inter-Coalition contests." It also explains why the seat is listed here as Critical. So we have two options. If we treat the Coalition parties as one, O'Connor no longer counts and only 4 Bastions changed hands (5%). Alternatively, if we count the Nat-to-Lib flip as a change of hands, then O'Connor is rated Critical and the corrected percentages should read: 25% of Tossups (4/16), 21% of Criticals (7/33), 11% of Standards (2/18) and 5% of Bastions (4/82) changed hands. Either way, we can conclude use the figures of 25%, 20%, 10% and 5% as rough approximations of a seat changing hands in each category (Tossup, Critical, Standard and Bastion respectively). How well these figures hold between federal elections (much less state elections) remains to be seen, especially given the lack of definitive guidelines on how to rate safety and volatility. Further analysis of the size of swings relative to the predicted volatility of a seat may be conducted at a later date. I may also look at the margins of each seat compared to its safety and overall rating. However, as this method does not predict outcomes of elections (with Critical and Tossup seats effectively undetermined) it will never be possible to determine a value for the accuracy of this method as a predictive tool. It is, however, clearly useful in highlighting the seats to watch. At least, it would be if it were usable for anything other than federal elections. Although much of the data can also be determined for state seats, one of the factors for getting a feel of each seat's security is the results of more recent elections. While the state seats that compose a federal division might be useful to roughly summarise the opinions and ideologies of groups within the latter, the same does not work in reverse. It is far more accurate to call a federal seat for a party based on the overwhelming lean in its constituent state divisions than to call a state seat because it is a subset of a federal seat. And average of smaller seats can be used as an approximation for a large area roughly representing their combined populations, but one cannot use a wider average to accurately reflect a small subsection. To use the example of O'Connor above, Albany (a state seat) is located entirely within this federal division. Albany was a Labor seat, but O'Connor was accurately called Coalition because this was out weighed by the other (predominantly Nationals) state seats. In reverse, we cannot use the general Coalition trend of O'Connor as an approximation of Albany.